When we see headlines about data breaches, they are often about big, corporate entities, in which hundreds of thousands, or even millions of personal identities and financial profiles have been exposed. According to Symantec, the number of publicly disclosed data breaches continues to rise. But these “mega breaches” aren’t the only thing security experts are worried about. There is also the specter of small,unreported data breaches. Small- and medium-sized companies are also at high risk of data breaches. While the payoff to cybercriminals may be smaller, they are still tempting targets because their security is usually less robust than an enterprise’s. It is likely that with all the mega-breaches occurring, far more small-scale breaches are going unreported. A business owner may not realize they’ve been hacked, or may feel embarrassed that they have been targeted. For many, it may simply be that they don’t know what to do when they’ve been attacked. There are many ways that small businesses can protect their data, and we’ll continue to promote thesepreventive measures whenever we can. But those that aren’t taking these precautions are opening themselves up to attacks needlessly. Victims are often bewildered in the wake of a data breach; this isn’t a daily occurrence for most people. Fortunately, there are experts who deal with these issues regularly, which is why every small-business owner should at least be aware of the incident response industry. Incident response services help their clients recover as quickly as possible from data breaches. They identify what data has been exposed, collect and preserve evidence for the investigation, and then secure systems from future attacks. Whereas a small organization may not be able to retain a full-time team to proactively maintain a secure IT infrastructure, incident response services can be brought on reactively, as needed. Fortunately, there are many providers out there, each with their own portfolio of services, specialties, and pricing structures. Researching your options is something you ought to be doing now, rather than in the wake of a data breach, when you’ll probably have many other things on your mind. Prevention is almost always going to be the most cost-effective solution to securing your online data. But in the constant arms race between cybersecurity and cybercriminals, even those that have protected themselves might become the target of an attack. If that ever happens to you, be sure you have a preferred incident response service in mind. It may not be a call you ever want to make, but in the flurry of activity that follows a data breach, it’s good to know that there is someone that you can call. Last week, the Internet Corporation for Assigned Names and Numbers (ICANN), the organization that effectively governs Internet infrastructure, announced an official date for a new policy regarding domain name transfers for all gTLDs (non-country code domains). The change will go into effect for all users onDecember 1, 2016. While six months may seem like a while from now, the policy will require some adjustments, so we wanted to give all of our customers, partners, and developers as much time to prepare as possible. Any time you confirm a change to the first name, last name, or email address for a gTLD domain, thatdomain will be locked into the same registrar for the next 60 days. For those resellers that have integrated with our platform, some changes to the API will be requiredto ensure the new policy is properly implemented. We’re hard at work developing the changes to our platform and will deliver the technical specs for the API as soon as we can, and well ahead of the policy change. You will want to communicate the policy change to your own customers which may also necessitate some changes to your UI. Enom will support your outreach efforts by developing and delivering educational materials for you to leverage. 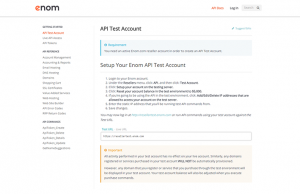 While this is a big change that will affect thousands of users every day, we’re committed to maintaining the stability, security, and compliance of the Enom platform, and support our customers using the platform. We appreciate your patience as we continue working on the implementation of the policy up to the December 1st deadline. But this will not be our only notice to you. We know that our reseller channel will want as much time as possible to prepare, test, and implement the policy themselves. To that end, we will continue updating you as we finalize our own approach to the change, and deliver many more details on our approach soon. In the meantime, to stay in the loop, be sure to keep watching this blog, subscribe to our regular retail andreseller newsletters, or browse the new Developer Hub. We talk a lot about the benefits of new generic TLDs on this blog—their value as branding tools, their availability versus legacy domain extensions, their ability to stick in people’s minds—but no matter how much information we could publish, we’re really just scratching the surface of what the wider gTLD community and domain industry are putting out. To give you a glimpse of the number of online resources available to individuals, companies and brands, we’ve put together a short list of helpful sites. The Enom Blog – Of course, no list could be complete without mentioning this very blog. Here you’ll find not only information about new TLDs, but also how-to’s and promotions that affect you directly as one of our customers or partners. Rightside.NEWS – Rightside Registry’s blog keeps up with trends in the domain industry, highlights examples of new TLDs being used all over the world, and offers insight into investing in gTLD domains. Name.KITCHEN – Domain registry Donuts operates the uniquely titled Name.KITCHEN. Fittingly enough, the blog focuses on the power of names and brands for individuals and small businesses that want to express themselves and stand out online. InTheWild.DOMAINS – The Domain Name Association runs Domains in the Wild, an evolvingexhibit of domains (using both legacy and new domain extensions) that have been registered and built out by brands all over the world. 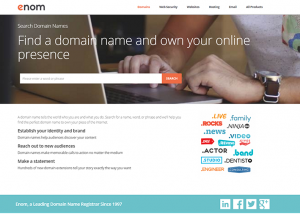 Showcase.NINJA – Rightside adds use cases from several gTLDs (like .LIVE, .ROCKS, .SOCIAL, and .FAMILY) to demonstrate that anyone can register their “Name.TLD” to express themselves online the way they want to the audience they want. Gen.XYZ – As the most-registered gTLD in the world, .XYZ certainly has many examples to draw on. They display .XYZ domains exactly as you would experience them yourself: on the screen of a desktop, laptop, tablet, or phone. nTLDStats – If numbers are your thing, then nTLDStats might be your new favorite site. Every day, registration statistics for every gTLD in existence is tracked and charted, giving the public a better understanding of the “health” of various domain extensions. CSC gTLD Utilization Report – Brand registrar CSC compiles a regular report on the growth and usage of .brand TLDs. They also devote a few pages each month to generic TLDs, using Alexa rankings as a stand-in for popularity and usage. YourStory.LIVE – Each Tuesday, YourStory.LIVE points to a live chat on Blab talking about new TLDs and talking to the people that use them. When offline, YourStory.LIVE redirects to the most recently recorded episode. Domain Name Wire podcast – Andrew Alleman interviews some of the biggest names in the domain industry, from investors, to registry/registrar operators, to the people putting domains to use. A must-listen for anyone interested in working with domains. ICANN blog – The Internet Corporation for Assigned Names and Numbers is the closest thing we have to an “official” administrator of the Internet. They run the new gTLD program, so the decisions they make (and announce here on their blog) have repercussions for the entire industry. Circle ID – News and commentary about the domain industry (indeed, the overall Internet infrastructure industry) finds a home at Circle ID. Articles here can be policy heavy and/or technically complex, but offer a glimpse into the many stakeholders and issues that interact in today’s online ecosystem. DomainSherpa – Michael Cyger runs DomainSherpa, a source of news for domain investors hunting for data and trends that could benefit their portfolios. Michael also hosts a podcast interviewing domainers and operators. DomainIncite – Since 2010, DomainIncite editor Kevin Murphy has posted news and commentary on the latest events, sales, and policies affecting domain names. Domaining.com – A great one-stop shop for domain investing news, domaining.com aggregates headlines from around the industry into a single feed.